The start of the year was positive for markets despite the continuous deterioration of economic growth data. The fed’s change in rhetoric and dovish message boosted investor sentiment, but in overall we remain cautiously constructive as we expect equities to remain range bound and rates to be capped for the next few months. Our global risk sentiment is pointing to mild disinclination, which is reflected on our equity and government bond preferences as well, while credit remains less attractive especially versus the liquid equity markets. Equity markets have had a flying start to the year so far, contrasting with the doom and gloom of last December. The key question is thus: "Is it a bear market rally or a new bull market?" We tend to favour the first proposition. Obviously, there was some dislocation, exaggeration and a few bargains for the bravest at the end of 2018, but what has really changed over the last few weeks in order to turn us more bullish – especially after the recent quick rebound? On the macro side, the economic growth backdrop has continued to deteriorate. This can be seen in Europe and Japan, which are now flirting with stagnation, but also in the US, as the fiscal stimulus boost gradually fades away – the government shutdown won’t help Q1 figures either. There have been some tentative signs of stabilisation in Chinese data, vague announcements of additional easing policies, and recent hope about a trade deal with the US, which may turn out to be just a truce. As a result, don’t expect any stabilisation in growth before spring… at best. On the inflation front: it remains muted and well under control, even after ten years of expansion in the US and major developed market (DM) economies. Bond and inflation vigilantes, who finally had a few hours of glory last year, suddenly disappeared in Q4 with the meltdown of oil and risky assets. As a result, the only significant change has been the Fed’s rhetoric. What Jerome Powell had broken in October by appearing too hawkish, he has now repaired by massaging investor sentiment with words such as ‘patient’, ‘flexible’ and ‘data dependant’. The Fed came back just in time to stop the bleeding before it got out of control. So, what now? There are two potential scenarios. Either growth picks-up in the second half of this year, and the Fed will have to continue to normalise – as well as other DM central banks – pushing down the valuations of assets which may not have had enough appeal when compared to a positive real return on plain vanilla cash. Or growth dies slowly in a long, soft landing – we don’t believe in a nasty and sharp recession scenario at this point – and dream on an upside surprise on earnings for the next few quarters. In conclusion, equities should remain range bound, and rates capped for the next few months. Thus, we remain cautiously constructive, being somewhat underweight on both equities and duration, especially on the euro curve, with some dry powder to redeploy when valuations become more attractive. As the debt clock continues to tick and DM central banks are running short of effective ammo, an allocation to gold makes sense today. A zero yield is actually better than the promise of negative yield on about $8trn of indebted government bonds. From a macroeconomic perspective, we are glad 2018 is over. It has been a year of disappointing economic activity, rising global risks and less accommodative credit conditions. The last few weeks of the year did not alter these trends, with weaker economic indicators in Europe, China and even the US, combined with another Federal Reserve rate hike and the ECB confirming the end of quantitative easing. Downside risks prevail for the global economy, but we believe the most likely outcome this year remains a stabilisation of global growth at a decent level. Whether these downside risks will materialise or not depends on three key issues. 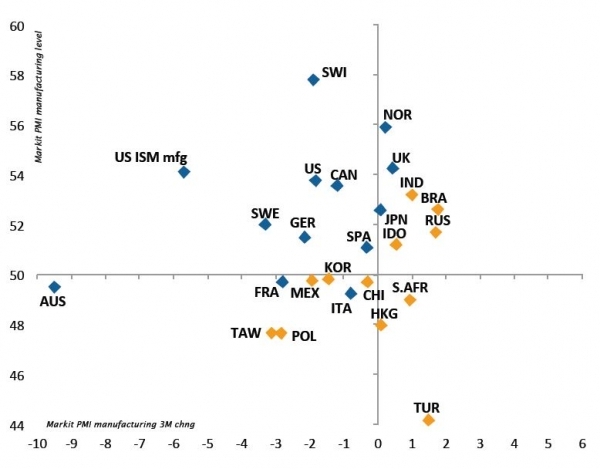 The first one is monetary policy divergence between the US and the rest of the world. With global growth losing steam, rate normalisations should pause. In fact, Fed members recently conveyed a reassuring message, calling for ‘patience’, in contrast to their hawkish stance from a few months ago. The two other key elements required to sustain a constructive macro framework this year are evidence of stabilisation in Europe and China. Last year’s economic slowdown was unpleasant but left growth in positive territory. However, from current levels, any further deterioration would become problematic. Accommodative fiscal and monetary policies plead for stabilisation going forward, but an array of political risks, including trade negotiations, Brexit and European elections, coupled with weaker private sector sentiment, tilt the balance of risks to the downside. As such, these three points do not yet provide enough reassurance to sound the all-clear. The Fed’s more cautious stance is a positive development, but a fragile one. China’s growth outlook is still uncertain and under the threat of US tariffs, and Europe does not show any concrete signs of bottoming activity yet. While the prospect of an improved macroeconomic environment later in the year remains our base case, the uncertainties and risks of 2018 are likely to remain present in the coming months. Europe and China are impacting the global growth slowdown directly and indirectly, by affecting all the economies that rely on the two giants for end demand. North America has also recently been losing momentum. Base effects on energy prices are currently weighing on headline inflation dynamics, in a context of feeble underlying inflationary pressures across developed markets and in several emerging markets. A softer growth dynamic, lack of inflationary pressures and a broad-based trend towards policy normalisation leave monetary policy accommodative, but less than a few month ago. Cyclical headwinds started affecting all developed economies towards the end of 2018. The eurozone extended its slowing trend, with France experiencing a pronounced slowdown due to the impact of social unrests – the effects of which were particularly felt in retail. The US economy is experiencing a softening growth dynamic, although it is unclear for the moment whether this is simply the dissipation of the fiscal ‘sugar high’ combined with external factors, particularly trade, or something more peculiar relating to underlying domestic growth dynamics. Interestingly, Japan remains on an unspectacular but quite steady expansion path, supported by domestic demand. While the prospect of an improved macroeconomic environment later in 2019 remains our base case, uncertainties are likely to remain present in the coming months. China’s slowdown has been one of the key macro features of 2018. Economic policies have gradually become more supportive in the past few months and are expected to help stabilise economic activity in the course of the year, but the impact of these measures has yet to show up in economic data. Softer Chinese momentum is weighing on neighbouring south-east Asian economies, similarly to what is visible in Eastern Europe, where the eurozone slowdown is beginning to be felt. With Mr. Bolsonaro at the helm of Brazil, the economy is still benefitting from the improvement in sentiment from his election and is one of the few large EM economies exhibiting a positive dynamic. Structural challenges obviously remain, especially the vital pension reform, but short-term momentum is favourable. Amid a generally depressed inflation environment, a few economies, such as Mexico, Russia and Turkey, are still experiencing upward inflationary pressures. This is essentially due to domestic factors, which are forcing central banks to lean towards a restrictive stance. 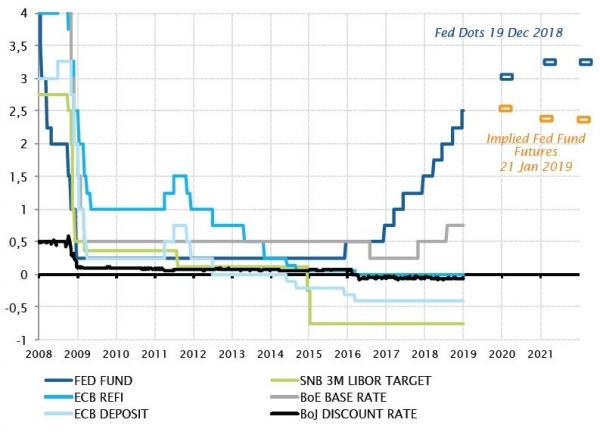 The Fed is expected to pause in 2019, and other central banks are unlikely to be able to normalise much. Low rates will prevail in 2019. The economic backdrop is not sufficient to warrant an upgrade of our risk stance. Global growth is slowing, even in the United States, and the latest Chinese data does not yet support a rebound of the Chinese economy. In addition, there are still uncertainties regarding a trade agreement between the Unites States and China. Hence, we are willing to wait for more clarity before eventually upgrading our risk stance. For the moment, we believe a rally in equites is limited; on one hand by Federal Reserve rate hikes if activity improves, and on the other hand by worries surrounding growth. Moreover, we believe central banks will not dramatically change their stances going forward, unless a looming recession and/or systemic risk materialise – which we do not anticipate. In this context, we are keeping our risk stance at a ‘mild disinclination’. We do not have a sectoral bias, but we tend to favour high quality dividend stocks – instead of credit – that offer attractive carry, with a yield above 4%, and are less volatile than the rest of the market. We still prefer the US equity market compared to Europe. Going forward, we may upgrade emerging markets over Europe if macroeconomic data improves, we see progress concerning trade tariffs and a steadying or softening US dollar. Duration was kept unchanged from last month, at a ‘mild disinclination’. Rates have a limited downside, as levels remain low, but it is worth having some duration in portfolios to balance risk. In addition, the macro dynamic is gradually losing strength and the pause in normalisation does not support a significant increase in rates. "We kept our global risk and duration assessments unchanged as the economic backdrop, coupled with valuations, are not sufficient to trigger upgrades. But UK assets are starting to appeal in terms of valuations and risk-adjusted returns." Overall, equity risk premiums improved in nearly all developed equity markets during the course of the month, but without reaching ‘dirt cheap’ levels. This improvement came from lower bond yields in December and higher costs of capital. Emerging market valuations were not altered much, as these markets were more resilient in December and valuations were already quite cheap. UK equities were upgraded by one notch to a ‘mild preference’ on the back of attractive valuations, high dividend yield and because they have recently been out of favour. A lot of the bad news is priced into UK equities and sterling, while UK equity valuations remain cheap, hence there is more potential to surprise on the upside with limited downside risk. A no deal or hard Brexit would be the worst scenarios for markets, but they seem very unlikely. South Africa was also upgraded to a ‘mild disinclination’ to decrease our underweight to emerging markets. Despite valuations having slightly deteriorated, nominal government bonds remain attractive in the current economic environment and are at a ‘mild preference’. Inflation-linked bonds were kept at a ‘mild preference’ as valuations improved. Investment grade and high yield credit valuations did not improve enough to trigger any upgrades. We still prefer liquidity in the equity space over the less liquid credit world. In the emerging market space, debt denominated in hard currency remains better value compared to local currency. We upgraded the British pound by one notch to a ‘mild preference’ on the back of valuations and increasing prospects for a soft Brexit. There was no other change in our currencies scoring this month. We kept our ‘mild preference’ for the Japanese yen over the US dollar to bring decorrelation to the portfolios, while the Swiss franc remained at a ‘disinclination’. He have gold at a ‘mild preference’ for its diversification characteristic in the current risk-off environment.